Two coaches carrying high school girls on a school trip are hit by a sudden gust of wind that slices the buses and their sitting passengers in half. 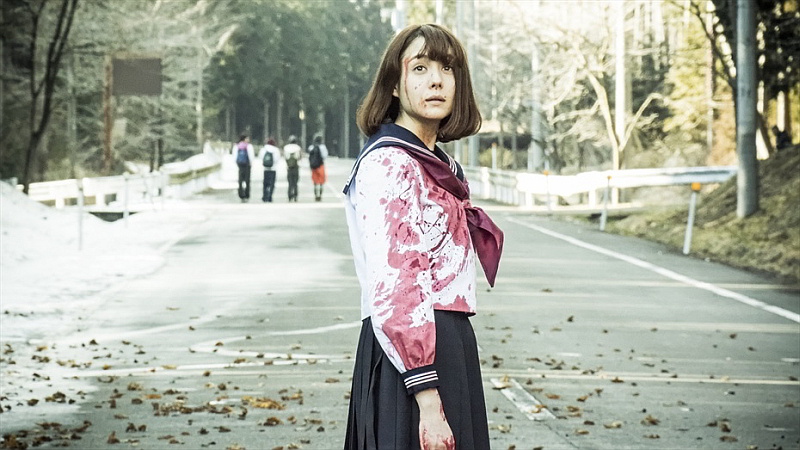 Everyone is killed but Mitsuko (Reina Triendl), who just then was on her knees picking up her pen. It is with this literally breath-taking visual motif that Sion Sono begins his new film, and the scene haunts the rest of the story. Tag is one of the six films that the insatiable Japanese director shot this year, two of which were presented at this year’s L’Etrange Festival. You might think that Sion Sono bites off more than he can chew, all the more so as his subject is not very original, since Tag is an adaptation of Yusuke Yamada’s successful novel Riaru Onigokko (The Chasing World). Yet neither the five low-budget films nor the short TV serial that preceded Tag hold a candle to it. After escaping death, Mitsuko runs away from the supernatural wind-like forces that pursue her, and by changing clothes, she transports herself to another world, where she meets new schoolmates who seem to recognise her. This we only understand thanks to the character of Mitsuko’s girlfriend Sur (short for Surreal), who exposes a theory of parallel universesthat can be altered by any unexpected action. In the second world, death again awaits Mitsuko, this time in the form of a berserk teacher who starts shooting her pupils with a machine gun (Sion Sono offers some comic relief here, nodding to Wes Craven’s Freddy by having the teacher make a screeching noise with her gun while looking for survivors). Another universe shift and Mitsuko metamorphosises into Keiko (Mariko Shinoda, ex-member of AKB48), who is about to get married. But as the wedding ceremony turns into a Kung-Fu slaughter, another shift occurs, together with another identity change, giving us Izumi (Erina Mano, also in Love & Peace) as a racing champion). Sion Sono’s main departure from the novel is to change the target of the demons’ attention (in Japanese the game of tag is literally called ‘demon (oni) game’) by replacing characters named Sato with three girls whose names recur in his filmography: Mitsuko, Keiko and Izumi. This enables him to use the novel as a pretext to craft a complex film combining a theory of Twilight-Zone-like parallel worlds with a reflection on the female condition in today’s Japan, reduced to three roles: a fantasised schoolgirl, a successful student or an obedient wife. Despite the dashing rhythm of the three heroines’ unending flight, the whole film is suffused with dream-like sadness and despair, which Sion Sono captures in wide shots of forests and snowy landscapes that are interspersed with the action. And the final scene of the nuptial bed, with a young man in his underpants inviting Mitsuko to consummate the union, leaves the heroine with only one disturbing way to exit the infernal cycle of a Japanese woman’s life. This review is part of our Etrange Festival coverage.